The Flowering Dogwood is one of the most sought after plants for Southern landscapes...to the point that I personally find it difficult to imagine Atlanta in spring without conjuring images of bright white and pink dogwood blossoms. On the festival scene, Atlantans are looking forward to the 75th Annual Dogwood Festival next week (Friday-Sunday, April 15-17, 2011) to be held in Piedmont Park. Dogwoods are in full bloom all over the city now so they should make a spectacular appearance for the Festival. In 1995, President and First Lady Clinton planted a Flowering Dogwood on the grounds of the White House to memorialize the lives lost in the Oklahoma City Bombing. Additionally, the Dogwood is also the state tree of Virginia and Missouri and the state flower of North Carolina. What may not be widely known (outside of the horticultural, botany, and dogwood enthusiast crowds) is that there are approximately 65 species of Dogwood that thrive in the northern hemisphere, South America, and Africa. 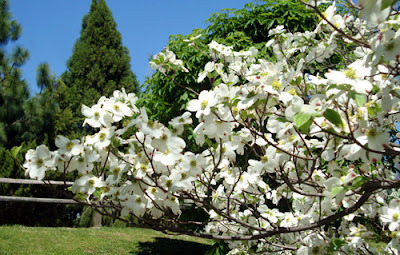 Actually, the Dogwood is tree of British Columbia, which also has Dogwood blossoms in its Coat of Arms. So...what I once thought was mostly popular in the South is actually a global passion...the tree and its flowers are quite beautiful after all.